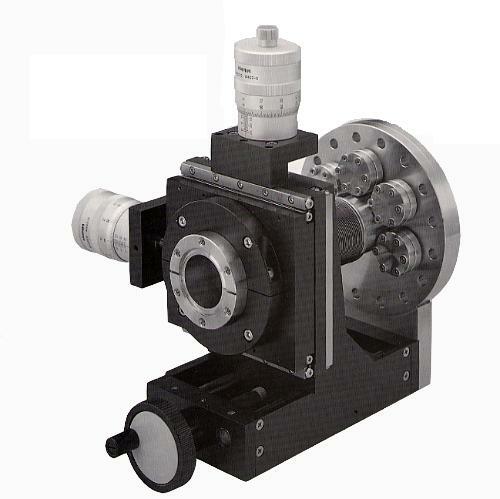 These XYZ Manipulators are applicable to the precision movement or positioning of the sample in various UHV conditioned chambers from outside the vacuum. Three axial movements are supplied as standard and 4 or 5 axial movements can also be used in combination with various optional kits. Smooth and high-precision positioning available without breaking the vacuum by the use of flexible and reliable edge welded bellows. Multiport accessory flanges (ICF034FT x 5) prepared on the mounting flange. Z-axis travel is 50mm or 150mm as standard. "+T" type is equipped with a tilt motion attachment. Many options available, please see MR series rotary motion drives.